Servant of God: The bishop of a diocese gives permission to open an investigation into an individual, usually in response to a petition by members of the faithful. Most often, a guild or organization to promote the cause of the candidate's sainthood is created, an exhaustive search of the candidate's writings, speeches and sermons is undertaken, and eyewitness accounts are gathered. When sufficient information has been gathered, the investigation of the candidate, who is called "Servant of God," is presented by the local bishop to the Congregation for the Causes of the Saints—where it is assigned a postulator, whose task is to gather further information about the life of the Servant of God. Venerable: When enough information has been gathered, the congregation will recommend to the Pope that he make a proclamation of the Servant of God's heroic virtue, which means that the servant exhibited the theological virtues of faith, hope and charity, and the cardinal virtues of prudence, justice, fortitude and temperance. From this point the person is referred to by the title "Venerable." Prayer cards may be printed to encourage the faithful to pray for a miracle wrought by his or her intercession as a sign of God's will that the person be canonized. Blessed: When a person is referred to as "Blessed," it means that they have been beatified. Beatification is a statement by the church that it is "worthy of belief" that the person is in heaven, having come to salvation. Saint: To be canonized a saint, at least two miracles normally must have been performed through the saint's intercession after his or her death. If a potential saint had been declared a martyr, only one miracle is needed. All of the holy people depicted here are in various stages along the way, but all have in some way touched the lives of New Yorkers. 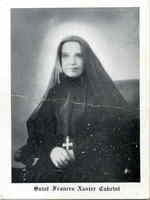 Maria Francesca (Mother Frances Xavier) Cabrini was born in Lombardi, Italy in 1850, one of thirteen children. At eighteen, she desired to become a Nun, but poor health stood in her way. While teaching at a local girls’ school at the request of a priest, her Bishop asked her to found the Missionary Sisters of the Sacred Heart to care for poor children in schools and hospitals. At the urging of Pope Leo XIII in 1889, she brought six nuns to New York to work among the Italian immigrants. When she died in Chicago on December 22, 1917, the Sisters had houses in England, France, Spain, the United States, and South America. She had also founded several schools, hospitals, and orphanages. In 1946, she became the first American citizen to be canonized when she was elevated to sainthood by Pope Pius XII. St. Frances is the patroness of immigrants. Born in Manhattan, Terence Cooke was raised in the Bronx, where he attended St. Benedict’s Church and School. Educated at Cathedral College and Saint Joseph’s Seminary, Dunwoodie, Cooke was ordained to the priesthood by then-Archbishop Spellman in 1945. Upon his completion of studies in social work at the Catholic University in 1949, Cooke served as archdiocesan director of the Catholic Youth Organization (CYO), procurator and faculty member at Saint Joseph’s Seminary, vice chancellor, chancellor, and vicar general of the Archdiocese of New York. In 1965, Cooke was ordained a bishop by Cardinal Spellman and on April 4, 1968, was installed as the seventh archbishop of New York. In 1969, Cooke was elevated to the College of Cardinals by Pope Paul VI. Responsible for the implementation of the initiatives of the Second Vatican Council, Cooke also established the Inner City Scholarship Fund and inaugurated the archdiocesan newspaper, Catholic New York. As Military Vicar, Cooke traveled to numerous military posts as well as Vietnam. Cardinal Cooke died on October 6, 1983. In 1984, at the suggestion of his successor, then-Archbishop John O’Connor, inquiries commenced toward his possible canonization. Dorothy Day was born in Brooklyn, New York on November 8, 1897. After her family moved to Chicago, she was baptized in the Episcopal Church. She attended the University of Illinois at Urbana and became interested in radical social causes as a way to help workers and the poor. In 1916, she moved to New York City where she worked as a journalist, participated in protest movements, and developed friendships with many famous artists and writers. Day admired the Catholic Church as the “Church of the poor” and her faith grew after the birth of her daughter Tamar in 1926. Her decision to have her daughter baptized and embrace the Catholic faith led to the end of her common law marriage and the loss of many of her radical friends. While covering the 1932 Hunger March in Washington, D.C. for some Catholic magazines, she prayed at the national Shrine of the Immaculate Conception that some way would open up for her to serve the poor and the unemployed. Once back in New York, she met Peter Maurin, who had a vision for a society constructed of Gospel values. Together they founded the Catholic Worker newspaper which spawned a movement of houses of hospitality and farming communes that has been replicated throughout the United States and other countries. She died on November 29, 1980. A proposal for Day's canonization was put forth publicly in 1983. In March 2000, at the request of Cardinal John J. O'Connor, Pope John Paul II granted the Archdiocese of New York permission to open her cause, allowing her to be called a "Servant of God." John Neumann was born March 28, 1811 in Prachatice, Bohemia, now part of the Czech Republic. After studying at the University of Prague, Neumann traveled to New York to pursue his interest in missions in the United States, and he was ordained in 1836. His first work was with the German-speaking people in mission parishes near Buffalo, New York. In 1840 he joined the Redemptorists, a religious congregation dedicated to parish and foreign missions, and was the first Redemptorist to make vows in the United States. He became the superior of the American branch of the order. In 1852 he was named bishop of Philadelphia by Pope Pius IX. He was devoted to education and was the first ecclesiastic to organize a diocesan school system in the United States. He died on January 5, 1860, in Philadelphia, Pennsylvania and was canonized as the first American male saint in 1977. Thomas Price was born on August 19, 1860, in Wilmington, North Carolina. His parents were converts to the Catholic faith, and he was raised as a devout Catholic. He was ordained to the priesthood on June 20, 1886, and was the first North Carolinian to be ordained to the priesthood. One of Price’s tools for evangelization was the publication of the magazine Truth, which he began to publish and edit in April 1897. As time went on, Price began to emphasize more and more often in the pages of Truth the need of a seminary for the training of young American men for the foreign missions. At the same time, Rev. James Anthony Walsh, of Boston, was developing the same idea in the pages of The Field Afar. At the Eucharistic Congress in Montreal in 1910, the two priests met and began to formulate plans for the establishment of a seminary for foreign missionaries. With the approval of the American hierarchy, the two priests traveled to Rome in June 1911, to receive final approval from Pope Pius X for their project. Returning to the United States, Price, together with Walsh, began the plans for the establishment of the new seminary and the foreign mission society. After a brief stay at Hawthorne, New York, property was purchased at Ossining, New York, for the site of the new society: the American Catholic Foreign Mission Society (popularly known as Maryknoll). By 1918, three young priests (Frs. James E. Walsh, Francis X. Ford, and Bernard F. Meyer) were ready for the foreign missions in China. On September 7, Price went with them as superior to the new missions. On September 12, 1919, he died in Hong Kong as a result of a burst appendix. Elizabeth Ann Bayley Seton was born on August 28, 1774, in New York. She was raised in upper class of New York society, and was reared a staunch Episcopalian. At 19, she married a wealthy businessman, William Magee Seton. They had five children before he died of tuberculosis and Elizabeth was left widowed and penniless. While in Italy before her husband’s death, she witnessed Catholicity in action through family friends, and converted in 1805. At the suggestion of the president of St. Mary's College in Baltimore, Maryland, Elizabeth started a school in that city. While the school had originally been secular, Seton, and two other young women who helped her in her work, soon began plans for a Sisterhood. They established the first free Catholic school in America. When the young community adopted their rule, they made provisions for Elizabeth to continue raising her children. On March 25, 1809, Elizabeth Seton pronounced her vows of poverty, chastity, and obedience, binding for one year. From that time she was called Mother Seton. The Rule of the Sisterhood was formally ratified in 1812. It was based upon the Rule St. Vincent de Paul had written for his Daughters of Charity in France. By 1818, in addition to their first school, the sisters had established two orphanages and another school. Today, six groups of sisters can trace their origins to Mother Seton's initial foundation. Seton died on January 4, 1821 at the age of 46, only sixteen years after becoming a Catholic. She was beatified by Pope John XXIII on March 17, 1963 and was canonized on September 14, 1975 by Pope Paul VI. Elizabeth Ann Seton was the first native born American to be canonized by the Catholic Church. Peter John (Fulton) Sheen was born in El Paso, Illinois, where his first role in the Church was as an altar boy at St. Mary's Cathedral. He attended Saint Paul Seminary in Minnesota and was ordained on September 20, 1919. He then studied at The Catholic University of America in Washington, D.C. and earned a doctorate in philosophy in 1923 at Belgium’s Catholic University of Leuven. While there, he became the first American ever to win the Cardinal Mercier award for the best philosophical treatise. He eventually returned to the Catholic University, where he taught philosophy until 1950. He published his first book in 1925, and in 1930 began a weekly Sunday night radio broadcast, The Catholic Hour. Two decades later, the broadcast had a weekly listening audience of four million people. In 1951 he began a weekly television program titled “Life Is Worth Living.” He was consecrated a bishop on June 11, 1951, and served as an Auxiliary Bishop of the Archdiocese of New York from 1951 to 1965. His television show ran until 1957, drawing as many as 30 million people on a weekly basis. In 1958, he became national director of the Society for the Propagation of the Faith, serving for eight years before being appointed Bishop of Rochester, New York, on October 26, 1966. On October 15, 1969, one month after celebrating his 50th anniversary as a priest, Sheen resigned as Bishop of Rochester and was appointed Archbishop of the Titular See of Newport (Wales) by Pope Paul VI. This ceremonial position allowed Sheen to continue his extensive writing. Archbishop Sheen wrote 73 books and numerous articles and columns. Sheen died on December 9, 1979. Sheen was declared Venerable Servant of God by Pope Benedict XVI on July 28th 2012. Pierre Toussaint was born in 1766 as a slave in Haiti. At some point in his life he moved to New York City, where he died as a free man in 1853. Toussaint was instrumental in raising funds for the first Catholic orphanage and began the city’s first school for black children. He also helped to provide funds for the Oblate Sisters of Providence, a religious community of black nuns founded in Baltimore. A member of St. Peter’s Church, the first Catholic Church in New York, Toussaint also played a vital role in providing resources to erect Saint Patrick’s Cathedral (now the Basilica of St. Patrick’s Old Cathedral) on Mott Street in lower Manhattan. During a Yellow Fever epidemic when many of the city’s political leaders fled the city, Pierre Toussaint cared for the sick and the dying. In recognition of Toussaint’s virtuous life, Cardinal Cooke introduced his cause for canonization at the Vatican in 1968. In December 1989, Cardinal O’Connor had the remains of Pierre Toussaint transferred from the cemetery at Old St. Patrick’s Cathedral to the new St. Patrick’s Cathedral on 5th Avenue, where he is buried as the only lay person, alongside the former bishops of New York City. On December 17, 1997, Pope John Paul II declared Pierre Toussaint Venerable, thus placing him on the road to becoming North America’s first black saint.